Come enjoy new creations by textile artist Claudia Law and the rich craftsmanship of John Weston’s woodwork at our October First Friday event. Law combines painting, 3-D fabric elements, beading, decorative stitching (hand and machine) and other multi-media treatments to create her art quilts. Her focus is on creating rich texture and color combinations in her pieces. 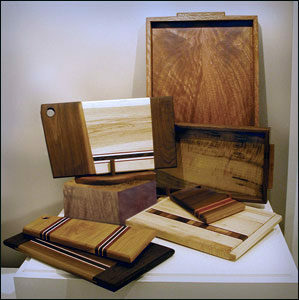 Weston’s woodworking will feature local woods originating from Lithia Park, the Rogue Valley, and Brookings. Quality woodwork at affordable prices. While here, be sure to wander the winding path to view our other galleries – five in all! We are especially proud of our newly remodeled Thrown Stone Gallery with its stunning view of Ashland Creek – a perfect place to view the work of our talented artists!